Magic Camouflage Belt Dermacolor Camouflage Series (special series offering water-resistant and abrasion-resistant make-up for reliable skin problems and blemishes) by Kryolan (the world's leading professional brand offering quality makeup, coloring and care cosmetics) is a specialized set of 6 different shades of camouflage in one package. The product has won the hearts of many users around the world, ideally suited for everyday use but also for more professional tasks such as modeling of models taking part in a photo shoot. Cosmetic will reliably cope with any skin defect . Acne scars, cracked cilia, discoloration and bruising will disappear in no time. 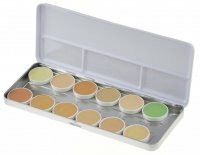 The Camuflage Rainbow is available in several colors, one circle contains several colors so you can easily get the desired color and everyone will find the right product for their own specific needs and skin tone. 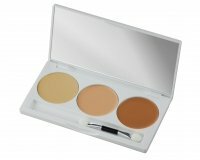 Thanks to camouflage, the complexion will be perfectly prepared for the next stage of make-up, and any skin imperfections will remain invisible throughout the day. 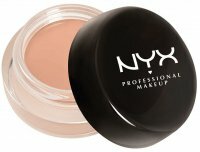 Cosmetics are very efficient and cover the desired defect the first time. 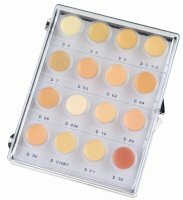 The appropriate consistency of the product allows it to spread smoothly on the face and does not create smudges and stains. The application is perfect for brushes or toes. The package contains 40 g of product. Camouflage does not dry the skin covered, have gentle moisturizing properties. 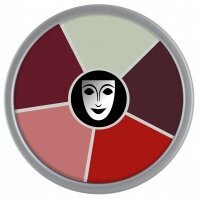 The darker and brighter shades of the wheels will also work well in face modeling. Additionally, in the range of colors you can find specialist camouflage, such as green, which is ideal for vesicular or reddening. 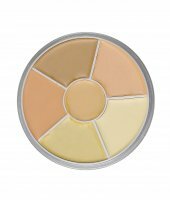 The yellow shade will perfectly cover the shadows under the eyes and will make the look refreshed. super nadaje sie takze do cery wymagającej, kremowa konsystencja swietnie kryje. Super produkt.